Glad you had such a great time, JM! Sounds like you had a blast. And a belated HAPPY 20TH anniversary to you and your wife!!! Any other cons coming up that you plan on attending? Thanks so much, A. Jaye. We did indeed have a wonderful time. Re: upcoming cons. I'll be at the one day Connecticut Comicon in August...Baltimore Comicon in September...and the Orlando Con in October. And that wraps it up for me in 2013, which was the busiest convention year I've ever had! Happy belated anniversary! And where better to spend it than Texas? Thanks, David! Next time I'm down there, I hope you make the trip and we can finally meet face to face. Definitely. Are you a lock for next year? We've been meaning to go to San Antonio for a while now, but the timing just didn't work out this year. Don't know yet if I'll be back next year, but there's a chance. They're moving to the big convention center downtown and that should really ratchet things up (in a good way). I think that's close to the Riverwalk. Awesome! We took a sweet little boat ride along the Riverwalk. (A stone's throw from the Alamo!) And, yes, I think the convention center's not far. Keep me updated on whether you'll be there next year, JMD! Thanks! And I just read LARFLEEZE #1. Great stuff! Funny and cosmic. Good use of irony with Larfleeze's narrative vs. the story as illustrated. And love the title riff on CITY ON THE EDGE OF FOREVER! I'm subscribing via Comixology (a new feature)! Glad you enjoyed it, David. We're having a blast with the book. I keep saying it's Jack Kirby meets Monty Python...and that's not far off the mark. Thanks for subscribing! One of the things we want to do with LARFLEEZE is keep it in its own little universe as much as possible, so you don't have to come in with a working knowledge of the DC Universe to enjoy the stories. We're aiming for the same thing with JL 3000. You won't have to read six other books to get it. We'll stand on our own. If you were ever to write a 4 part arc in the digital Batman and Superman series at the same time, you'd be 100% of my comics reading for the month! I'd love to do one of those Batman stories. But then again, I'll be getting my share of Batman in JL 3000! Another Dematteis book? I'm glad our talk about thinning ice didn't do to waste. So, if you win an Eisner for this mystery book, I think we all know who you have to thank. are you sure you don't have those names backwards? Well, the dreaded THIN-ICE SKATER was bound to return to his old tricks eventually! Supervillain? Ruling the world is WAAAAAAAAY too much of a hassle. I think I was just a bit more proactive than the almighty. Smooth, JMD. I notice you didnt say which Jack. I say why not both? You really outdid yourself with PHANTOM STRANGER 10, JMD. The best issue yet. Stunning visuals, fantastic dialogue ("Poetry is the language of angels"), a theology I find both wise and true, and a powerful ending. I think it rises to to level of the silent sequence from SSM 200. Beautiful, haunting work that embodies the best of 70s supernatural/horror while being very modern (timeless, I'd say). Thank you so much, David. Your kind words are DEEPLY appreciated. Damn, I forgot to put it on my pull list. It's the new "trinity of sin" thing. Guess I'll have to look for it Friday. Hope you enjoy it, Jack! well, with David talking it up, I just hope I can fond a copy, daddy-o. You're very welcome, JMD. I've been spreading the word about PHANTOM STRANGER where I can. There's really nothing else like it on the market right now. It's a good thing Batman will be there to help PS sort through his emotional crisis. Then again...probably not. But it will be good for readers! All I can say about the TRINITY WAR issue, David, is that it relates very directly to the events of PS #10. And I can say no more! It is difficult to believe that was 31 years ago. Sorry, I hope that doesn't make you feel old! In any case, until I have the opportunity to meet you in person, I'm grateful for your Creation Point blog, because it gives readers like myself an opportunity to correspond with you and let you know how much we have enjoyed your writings. Nice to hear from you, Ben, and thanks so much for that wonderful blog piece about those long ago days working on CAPTAIN AMERICA. Does it make me feel old? Maybe a little...but it also makes me feel grateful that my story provided a doorway into comics for you. One thing I should note about CAP #278: The idea for the scene you praise, where Cap launches into a speech to inspire the mutates, came from Jim Shooter and Roger Stern. At one point, Roger (perhaps the Most Valuable Player in Marvel's 1980's-era writing team) and John Byrne were planning a CAP graphic novel with a similar mutate problem and Shooter came up with the speechifying solution. As noted on the letters page of #278, when I came up against a similar story point, I turned to their solution. (There's a longer story behind this that I may write about one day.) So credit to ALL involved. I agree re: Zeck. I'd love to see him drawing comics again. He's one of the most gifted artists, and nicest guys I've ever worked with. Thanks for checking in, Ben. Have a Happy Fourth! 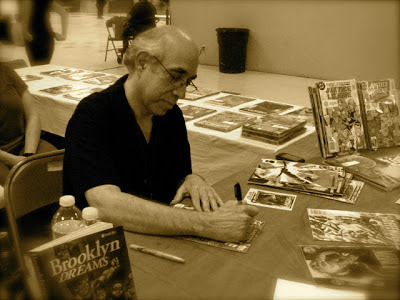 Mr. DeMatteis, that wonderful interview you gave me at Texas ComiCon in San Antonio is up on the web. Thanks, Clay. I'll give it a listen tomorrow! Say hi to Texas for me! No Phantom Stranger until Wednesday at the earliest. Thanks David. couldn't you wait one more week to spread the word? Well, as weird stuff goes, Jack, that "PKD at the Wal-Mart" was pretty weird. Thanks for sharing it! Thanks for signing my Phantom Stranger #9, and Gargoyle #1. It was cool to be able to talk with you. Your writing on Phantom Stranger has been phenomenal, and you've made me into a Justice League Dark fan, too. My pleasure, Casey. And thanks for your kind words re: PHANTOM STRANGER. I'm having a great time with the series. (Having an artist like Fernando Blanco along for the ride certainly helps.) And I certainly agree about JL DARK: a wonderful book and a terrific group of characters.